Batman is a character that attracts many, but the way these guys are attracted is unique. 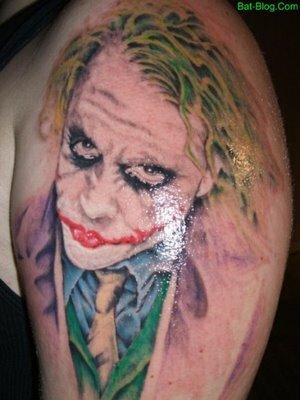 Itâs the Batman tattoo and a tribute to Heath Ledger as well. Tim Bowling, the Indianapolis tattoo artist has inked it with such a perfection that you canât dare to gaze it for long. The dark black eyes are ready to attack. Danny and Brad have given it a permanent place on their body; for they are great fans of the character. If you are madly in love with any character, do make your search for the best tattoo artist. Or else, it wouldnât be eye-catching like this scary Batman.